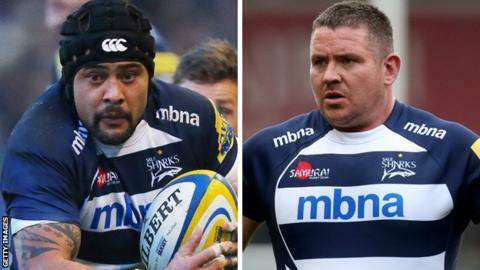 Sale Sharks pair Sam Tuitupou and Eifion Lewis-Roberts have both signed two-year contract extensions. Former New Zealand centre Tuitupou, 32, joined from Munster in 2011 and captained the club in his first season. Prop Lewis-Roberts, 33, who earned his one Wales cap in 2008, returned to Sale in 2012 after a year at Toulon. "He's part of the culture, he's a hard-working and destructive loose-head and I'm thoroughly glad he's agreed," Sale boss Steve Diamond told BBC Sport. Nickname: "Hacksaw Sam" Nickname: "The Fridge"
"Sammy is the best close tackling number 12 in the country. For him to agree for another two years in massive for us. "The team is built around people like him, Eifion, Dan Braid - that hard-nosed set of lads who are at the club." The duo follow Josh Beaumont, Mike Haley and Tommy Taylor in signing new contracts at the AJ Bell Stadium, with Diamond adding he expects more renewals to be announced next week. Sale are also understood to be in advanced talks with England fly-half Danny Cipriani, who is out of contract at the club at the end of the season.